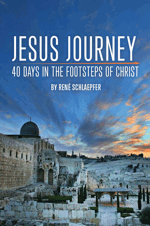 Jesus Journey → What is Jesus Journey? I see the moon’s rocky craters in razor-sharp detail. Its silvery surface dust seems close enough to sift through my fingers. Slight shift. The glowing planets Venus, Jupiter and Mars hang together in alarmingly close alignment. I turn east, and face the famous rings of Saturn. After two weeks of journeying through the past, I’m travelling into space. It’s the last night of our trip to the Holy Land. An amateur astronomer has set up his telescope on the Jordanian shore of the Dead Sea and I’m enjoying his tour of the solar system. “You know, telescopes aren’t just for stars,” he says. “Check this out.” He spins the telescope so it points horizontally, straight west. Across the Dead Sea. Into Israel. I bend down and take a peek. And suddenly I’m standing on the hills of Jerusalem. I see its buildings as if I’m right there on a city sidewalk. He moves the telescope slightly to the left. And I land in Bethlehem. The lights of that town fill my vision. I glance over my shoulder at the moon and planets I’d just been watching. I bend back down to peek at Bethlehem. And I see something in a way I’ve never seen it before. I see the greatest distance anyone has ever travelled. I see the road map to a rescue mission. I see the journey a love-struck God took to bring his lost children home. From far beyond the light of the Moon and Mars and Sun and stars, the true Light came into a dark world. He had the means and the motive. If there is an all-powerful Being who made everything, surely visiting us — as one of us — is child’s play for him. And if this Being is not just infinitely powerful, but, as the Bible teaches, infinitely loving, then such a Being would have the motivation to visit and save the fallen objects of his love. So in love he came into the breach, to be with us, to communicate his love to us, to woo us, and to rescue us. He didn’t just shout a message. He gave himself. The God who breathed out the galaxies came to breathe our air. The One who strolled the stars came to walk our streets. The angel-maker came to touch lepers. I stand there on the shore of the Dead Sea during our last night in the Holy Land and think of all we’ve seen on our Jesus Journey so far. We’d arrived two weeks before and hit the road hard, visiting site after site. Places Jesus lived and walked and taught. We thought we’d traced his steps. But illuminated by the glow of the stars above me, and an ancient town in front of me, I see more steps. The steps he took to reach us began much longer than two thousand years ago, and much further away than Bethlehem. What does it mean to you that God came to earth out of love for the world — including you? How does this impact your attitude and confidence?